The water carries your horse’s weight so it can move without pressure on its back or joints. Fantastic cardiovascular work-out. All muscles, tendons and ligaments work equally. The horses work hard, which improves their circulation. Our pool is straight, swimming straightens the horses noticeably! Because there is no concussion, your horse can keep moving and get rid of its energy. This minimizes the risk of uncontrolled movements. Each horse is given a personalised program at Horse Care Center. Treating each horse with respect is extremely important to us. Your horse’s wellbeing is our biggest concern! If your horse is coming to us for rehabilitation, we will work with your vet to set up the best possible training program for your horse. What is a walk-in swim? A walk-in swim is when you bring your horse just for swimming. Horses that haven’t swum before need to do our ‘First-time swimmer’s 3 sessions’. After that we offer both serviced and self-service swims. At the moment we only have very limited availability for walk-in swims. Our waiting list is a few weeks. The 3 sessions have to be used within 1 month. 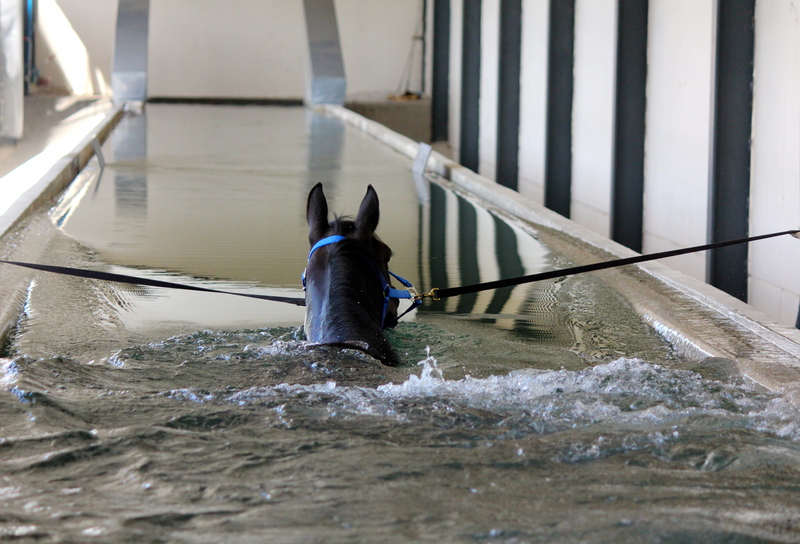 This way the horses get accustomed to the swimming quickly and can enjoy it! To make an appointment, please contact us (preferably via the contact form!). We do not do single swims!